Many birds tend to become ill in case they are exposed to draught or quick changes in temperature. A bird who suffers from a cold fluffs up the plumage, behaves apathetic, and in case the animal caught a cold (see below) the nose may also be running and from time to time the bird may sneeze. Other kinds of infections affect the lower respiratory tract (lungs, air sacs) and the bird makes sounds that remind of coughing. In fact, coughing is not quite correct since birds are unable to do so. They don't have a diaphragm and due to this difference in anatomy they can just make sounds that are a bit similar to coughing. 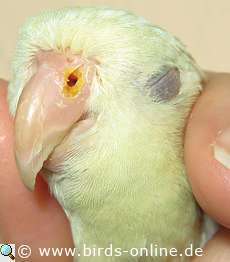 On the right you can see a lineolated parakeet whose nose is severly infected, it's a bacterial sneeze. The birds can be short of breath and in severe cases they may suffer from choking fits that last for several minutes. Due to this, many feathered patients become too weak to perch on their branches. They totter on the ground instead, desperately fighting to get enough oxygen while they breathe. 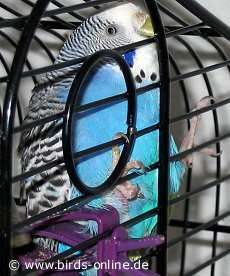 Some birds try to help themselves by attaching their beak to the bars of the cage. This posture enables them to stretch their trachea and breathing becomes a bit more easy. The photo on the right shows this behaviour. Often one can hear a sound with each breath a bird takes (see sound sample, wav file, 95 kB) that is typical for a respiratory infection. Also moving the tail feathers up and down with each breath and a "pumping" motion of the breast can be observed in affected birds. The following video shows this heavy breathing and the sounds you can hear in case a bird is ill. 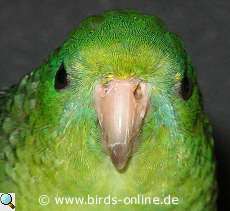 In the video, you can see a lineolated parakeet who suffered from a severe infection of the upper respiratory tract: video, avi with DivX-Kompression , 4,07 MB. 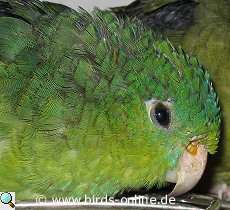 If you observe the mentioned symptoms you should meet your avian vet as soon as possible. Your bird needs an effective treatment with special drugs like antibiotics (not in each case, but quite often). In addition to this, there are some more things you can do to support the healing process. For example, a warmth therapy might be helpful. Please talk to the avian vet before you expose your bird to infrared light. Another household remedy is inhalation. Your vet will for sure tell you how you have to proceed to prevent hurting your bird (hot water, hot vapour). In humans, a typical cold is caused by viruses. The situation in birds is completely different. Viruses are irrelevant, instead birds suffer from bacterial infections of the upper respiratory tract. The problem is: If we humans suffer from a cold, the doctors call the disease "self-limited" because after a few days, the viruses naturally die and the cold is gone. But in birds, the bacterial cold will not heal after a few days. Far from it! It will even get worse because the bacteria proliferate and settle down in more parts of the nose, the sinuses and the mouth (pharynx). The nasal discharges are not watery but gooey and yellowish; this means they are purulent as you can see in the photo on the right. 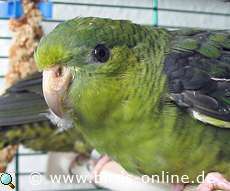 Also the nose (cere) can be swollen like the photo shows. Attention: Unlike a cold in humans, a similar disease with purulent nasal discharge in birds will not heal by itself. If the cold is not treated with an antibiotic it will become chronic! In the worst case the infection will destroy the nose and cere. The nostrils will be enlarged and the affected bird will suffer from pain and choking fits because of the mucus sticking in his nose. On the right you can see one of my lineolated parakeets shortly after he had been rescued from a home where nobody took good care of him. His former owner didn't realise that the cold would not heal by itself. The nose and sinuses were infected for several moths. Parts of the cere were destroyed and therefore the nares have become very large. In the left nostril you can see a scab consisting of dried pus and mucus. Also on the beak you can see pus (yellowish parts close to the nostril). Once enlarged, the nares of a bird will never regain their natural smaller size. Below you can see more photos of the sick linnie. If a bird's nose is congested, the animal can hardly breathe. Humans can blow their nose - birds are unable to do so. Therefore the bird owner has to help when there is mucus in a bird's nose. I find it very helpful to cut a tissue handkerchief into small pieces and rub the corners between my fingers to create tiny "nose cleaners" as you can see on the photo. You have to be careful not to push the nose cleaners into the nares too far. They soak up the mucus and bring the bird immediate relief. Each nose cleaner should only be used once! And please make sure not to touch the eyes with the used nose cleaner; else you risk an eye infection (ophthalmitis). Sometimes, ill birds can hardly breathe, but there is no mucus in the nose. In many cases the lower respiratory tract is affected by a disease. A bird who coughs after flying or at night may be suffering from an infestation with air sac mites. You can often hear a very typical squeaky sound with each breath your bird takes; this sound is caused by the tiny parasites. A swelling underneath the eyes can be a hint for a sinusitis. 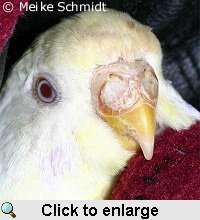 This is an infection of the sinuses and often no nasal discharge occurs while a bird suffers from this kind of disease. Very important: A cold can also be a symptom of the psittacosis! Please make sure your vet will check out whether your bird is infected it or not, because the psittacosis is a so-called zoonosis what means it can affect humans as well. If you suffer from a cold or any kind of infection of the upper respiratory tract you should not kiss your bird and wash your hands after using a tissue handkerchief. Else you would risk infecting your bird.